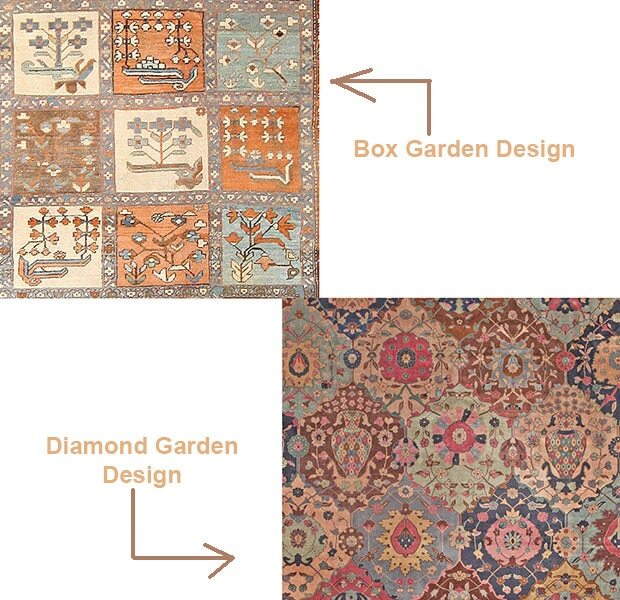 Antique Rug Symbols: Garden Design -- The original garden design in carpets is a pattern that illustrates a Persian garden from a "bird’s-eye view". 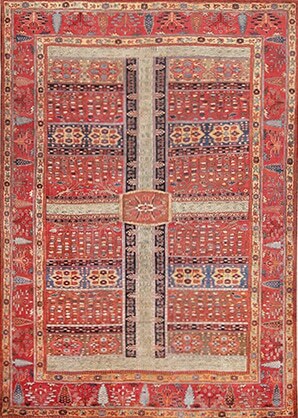 The oldest known carpet that depicts this iconic design served as the de facto design prototype for weavers (mostly in North West Persia) to follow. 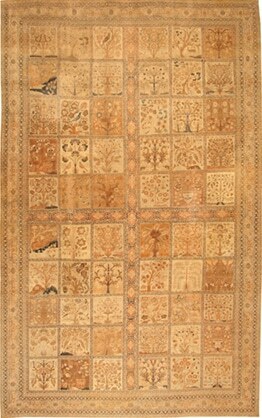 This carpet is dated 1622–32 and is currently part of the current Albert Hall Museum collection in Jaipur, India. The Persian garden will usually consist of classic four-parts (chahar bagh) encircled by a perimeter of tall cypress trees and shrubs to block strong winds and protect the vegetation. The pattern will show a wide stream of water in the center of the garden and intersected by narrower offshoots. 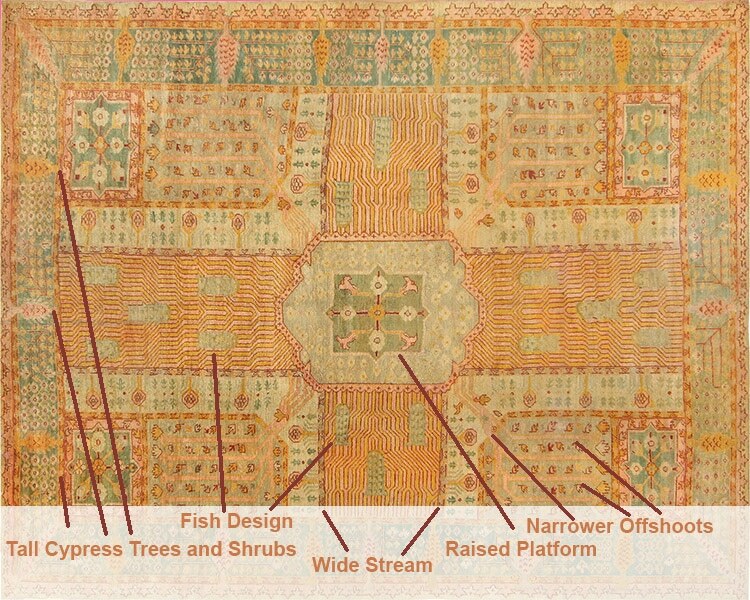 Most of the larger offshoots will feature designs of stylized swimming fish and at the center will be a depiction of the raised platform where the aristocracy would lounge. The famed "Garden Design" refers to the portrayal of flowers, trees and other vegetation often with a central fountain. In antique rugs featuring this theme, animals such as tigers, birds and deer were often portrayed in poses of repose and relaxation. Gardens were important in Persian life, representing paradise, and were portrayed on carpets to bring the visual and aesthetic appreciation of the exterior effulgence into the interior. Famous garden carpets include the legendary “Springtime of Khosroe” carpet woven between AD 531 and 579 during the Sassanian period. 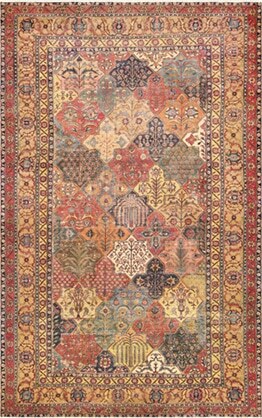 Garden carpets were popular in the Safavid period and Mughal culture as well. There are two other patters that are generally refereed to as: "Garden Design". These designs are of rugs that feature grid designs of either square boxed or more if a diamond pattern grid.